Provides calcium, chromium, iodine, boron, magnesium, selenium, zinc, vanadium, silicon and potassium. Minerals are essential for a number of the body's vital processes. Soil depletion and industrialisation of agriculture has left much of our food deficient in minerals. In addition, the minerals we do get from our diet are not always well absorbed; as with age, absorption becomes less and less effective. 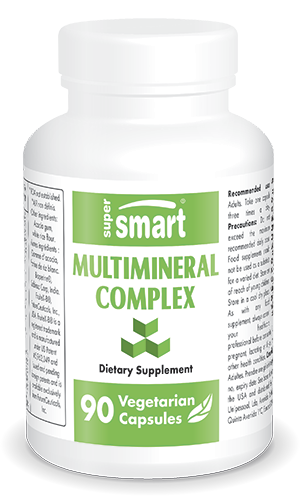 MultiMineral Complex is a complete formula providing calcium, chromium, iodine, boron, magnesium, selenium, zinc, vanadium, silicon and potassium, all of which are essential for a healthy body. Absorption and use of minerals by the body are particularly important. Scientific research shows that some forms of these minerals are better used by the body than others. Those forms with superior bioavailability have been selected for MultiMineral Complex. Similarly, doses and minerals have been chosen for their complementariness and synergy. Vitamin D3 is present essentially because it is necessary for calcium absorption. Bioperine is known to boost nutrient bioavailability and absorption and therefore, efficacy. The same is true of ginger extract, gingerols having a similar structure to that of piperine. Finally, the presence of digestive enzymes, lipase, amylase and protease, facilitates absorption of minerals, and as a result, their use by the body. MultiMineral Complex is a balanced and highly bioavailable formulation, designed for anyone who wishes to boost their mineral reserves. It is particularly suitable for helping to maintain bone mineral density in peri- menopausal or menopausal women as well as men over fifty. It can also benefit those on detox or chelation programmes, as well as sportspeople who have increased mineral requirements. Bioperine®, Sabinsa Corp, India. - FruiteX-B®, FutureCeuticals, Inc., USA.